One of Vienna's most famous residents, Dr Sigmund Freud revolutionised the study of psychology with his ideas. Though many of his theories, once wildly popular, have been discredited, the term 'Freudian slip' and other ideas are still widely known and debated today. 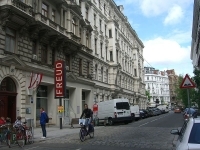 The Freud Museum in Vienna houses a number of antiques and mementos of the doctor inside the offices he practised in from 1891 to 1938. Guided tours are available and the museum has a gift shop offering photos and other memorabilia, as well as books written by Freud. This attraction will be very exciting for those interested in the great man and his work, and it will provide a good introduction for those unfamiliar with Freud. Transport: Take Tram D to Schlickgasse. Opening times: Daily 10am to 6pm. Admission: €10 adults, €4 children 12-18; other concessions available.